First of all, when I say freeze-dried produce, I mean produce—and almost exclusively PRODUCE—as in fruits and vegetables. The reason being is that I’m not really much of a fan of most other freeze-dried options—my detailed reasons for which will have to wait for another article as they are extensive. But for today, let’s just focus on freeze-dried produce such as strawberries, peaches, tomatoes, potato pearls and celery. Most folks I speak with are under the impression that freeze-dried produce is “too expensive”. While I admit the freeze-dried entrees and freeze-dried meats are typically priced exorbitantly, I find freeze-dried produce to be an EXCELLENT value. I don’t know if you’ve noticed over the past several years, but I’m sick and tired of the produce I buy at the grocery store going bad less than 48 hours after I get it home. I go to the grocery store primarily for fresh produce, as I have plenty of just about everything else already on hand. But my garden of lettuces, carrots, and tomatoes don’t feed me all year round and that’s what sends me to the grocery store. But thanks to so many of our farms being sold off for condominium projects, our food travels so far before it even gets to our grocery stores. Plus all of the chemicals that are used today on our food hasten their spoilage. In spite of the “shelf-life” of fresh produce going downhill fast, the quality of our produce is diminishing as well. Of course when this starts happening, people, like myself, are able to justify the cost of buying organic produce, even at double the price of their non-organic counterparts. After all, purchasing a clamshell of blackberries at $3.99 but have them go bad before you finish using them, is much more expensive than spending $5.99 for that same size if they manage to stay tasty and plump for an entire week, right? But even the organic market is performing poorly in some instances too and the term “organic” isn’t all it’s cracked up to be. As an example, the “organic” market is permitted to use pesticides and such without restriction so long as the components are derived from “natural ingredients.” There are many poisons in the world that occur naturally, of course. One of the most common “organic pesticides” used by “organic farms” is pyrethrum, which is a known carcinogen which the EPA's Cancer Assessment Review Committee chose to assume that even the smallest amount could cause tumors. Rotenone, a natural insecticide squeezed from roots of tropical plants, causes symptoms of Parkinson's disease in rats. Just because something is “natural” doesn’t mean it’s harmless and can safely be ingested without harmful consequences. After all, CO² is natural, but it kills or injures more than 20,000 people a year in the U.S. On top of all this, you also have the fact that the USDA permits more than 20 various synthetic chemicals to be used on organic produce under a variety of circumstances while still allowing the use of the USDA Organic label. Such use occurs when a particular mold or fungal problem occurs on the produce during specific times during the growth and maturation period, but synthetics are synthetics—no matter what paperwork was filed with the USDA. What’s also concerning is that the volume of the synthetic chemicals that’s used under the “special set of circumstances” isn’t ever disclosed to the public either—and that’s IF it’s even tracked or reported by the organic farms in the first place. By way of an interesting little factoid for ya, the National Center for Food and Agricultural Policy, stated that the top two organic fungicides, copper and sulfur, were used at a rate of 4 and 34 pounds per acre in 1971 1. In contrast, the synthetic fungicides only required a rate of 1.6 lbs. per acre, less than half the amount of the organic alternatives. In spite of all of this, millions of consumers a year pay 2 to 3 times higher prices for organic produce than non-organic. Anyway, my purpose in sharing this with you is to give you an educated “apples to apples” comparison—excuse the pun—when considering the value of freeze-dried produce. I do this because when I really dug down to the details of what I was paying for and what I got in exchange for the money, I found that freeze-dried produce is actually a BETTER value, quality, nutrition, and taste than it’s fresh counterparts and yet is comparable in cost AND comes with some highly valuable conveniences. Let’s take a look at these “cost to value” benefits a little more closely. I frequently go to the farmer’s market to get in season produce. I love getting it home and canning it or dehydrating it and splurging on some fantastic treat or two with the fresh produce. Obviously, when I get the flat of beautiful produce home I’m going to have some bruising, some unusable portions, and some stems and such. This year I went to my local farmer’s market and got a nice, big flat of plump blueberries. I was eating them like candy on the drive home. (So much for being concerned about “clean” produce, eh. I know. I know. Bad idea.) I paid $25 for this flat. (keep in mind that farmer’s market prices can be as much as 25% less than what one finds in their local grocery store.) Not a bad price, right? It's even better sometimes at the "pick your own" farms and of course, growing your own. Farmer's markets are great to use that way for IN-SEASON produce purchases--assuming that you can and will preserve the produce for later use. But let's see how freeze-dried produce can be an asset in our households otherwise. In my cupboards, I have #10 cans of blueberries that cost me as little as $9.98 for 1.25 pounds of freeze-dried blueberries to as much as $25. (Like everything I purchase, I buy in multiples when I can leverage my money the best.) Today I look around for pricing on #10 cans of whole blueberries—real, not the “flavored” garbage—and see pricing of $40 on Five Star Preparedness for .70 net weight can of freeze-dried blueberries; so we’re looking at about $53 for a pound of freeze-dried blueberries. I can understand why some may gulp in shock seeing a #10 can of produce, that feels so light, but seemingly costing so much! You see this simple little can and a price tag of $40 and just about have a heart attack. But that's because most of don't purchase a summer's supply of blueberries at one time. Even more importantly, it seems so pricey because most folks don’t pause to do the math. You see, what many people forget is that each pound of freeze-dried produce is equal to 10, to as much as 20 pounds, of fresh produce—depending on the kind of produce. For blueberries, one pound of freeze-dried equals 10-12 pounds of fresh. So that #10 can contains a pound of freeze-dried that expands into 10-12 pounds of fresh produce which brings the price per pound to $4.41 to $5.30 a pound—and that’s without a special sale. In order to properly freeze-dry produce, it must be done at the time of perfect peak harvest season, so you won’t get any of that “off season” lackluster taste—like the grapes and watermelon you buy in August. AND the freeze-dried technology used to create freeze-dried food is done in such a way that the chemicals and pesticides have to be entirely cleaned from the produce, so you're typically getting CLEANER produce when it's freeze-dried than you would with "organic" fresh produce without having to pay 2 to 3 times more than regular produce, AND the technology also means you get to retain 95% of the nutrients as you would have with fresh produce! You see? 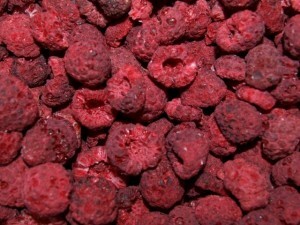 Freeze-dried produce isn’t the bad deal that you might have previously thought it was. In fact, it’s fast becoming a BETTER deal than what we’re being subjected to in the grocery stores. So save your Farmers Market trips to get in-season produce that you want to use immediately or can or dehydrate, and give your freeze-dried friends a place in your cupboards more regularly. That way you're not trying to financially duplicate your entire household of needs by buying freeze-dried food and just packing it away in a dark corner. That's an expensive way to "prepare." Perhaps NOW you can appreciate why freeze-dried produce and I get along so well on a regular basis in my household. It can do wonders for your budget AND your taste buds. Thank you for breaking it down. I had wondered but did not want to do the math. And didn't know how to figure out the reconstituted weight without breaking open a whole can. I could not eat a whole reconstituted #10 can of anything in a short time. I am looking forward to your future article on FD meats. I agree with the entrees for the most part already. How does CO2 kill people? Have you ever heard of "carbon monoxide detectors" or "carbon monoxide poisoning"? Excellent article, thanks Kellene. I think the confusion is CO2 stands for carbon dioxide (which we exhale). The chemical name for carbon monoxide is CO. On a separate thought, I was wondering if you know of a table that lists the reconstituted weights of freeze dried produce. In the article you mentioned the equivalent weight for blueberries. Having a table like this handy would make comparison of freeze dried produce prices to their fresh counterparts easier. Thanks again. There wouldn't be a general table out there--and if there is, I wouldn't rely on it because the final weight is dependent on the method of freeze-drying used. There are presently 4 different methods used in the industry. Sorry. I only am able to provide info on those that I've actually used/reconstituted or from those companies which publish THEIR results for their product. The method of achieving a freeze dried is totally irrelevant. Freeze dried is freeze dried end product. And yes a table of fresh to freeze dried would be very helpful for a whole lot of reason. . I'm sorry, but you're incorrect. There are 4 different methods. The variance in the method is indicative in the varying colors of the exact same foods, for instance. Gosh I love sharing your articles to my friends that call me crazy! Not to mention the way you break it down is so wonderful. You have a gift my friend and you inspire all the time. Now all I have to do is find a company that does not have the blanket label of "items may be processed on equipment that also process tree nuts and peanuts." Because that is a problem for my family. My daughter is deathly allergic to tree nuts and peanuts. She has gone anaphylactic on me to tree nuts and it is bad. There is no cure and exposing her to small amounts is a risk, I am not sure I can handle going through after seeing her fight once already for her life. So, I am writing to the manufactures of freeze dried food to see if they will consider their process. I know there are a lot of us with Food Allergic kids, that would pay for the piece of mind. If Dove Chocolates will do it to gain a market, than why not a freeze dried company? That is my pitch anyway. God Bless you my friend for all the time you spend on this journey. I am glad we are in the same corner. You'll pay an arm and a leg for it, but there are a couple of manufacturer's that actually care about that kind of exposure. Look for the GMO or Organic providers. They tend to be much more conscientious of that kind of stuff. Where do you buy your freeze dried food from? See the article entitled "Freeze-Dried Preferences" on here. That should help you. I tried some freeze-dried okra this week for the first time. It was $10.29 a pound, but I got quite a bagful for only a couple of bucks. It seemed as though it had been coated with oil before (or after drying). We loved it and will definitely get more. I thought freeze dried fruit didn't have to be added with water and could just be plopped into cereal or eaten from the can. Do you just reconstitute the fruit like you would dehydrated foods? Have you heard of the trick of freeze drying yourself by using dry ice and a styrofoam cooler? Very interesting article, thanks. You certainly CAN just add it to things however, one way or another you'll need to restore the water/liquid content in order to have it provide the maximum flavor and to digest properly. So when you add it to cereal, the milk is being absorbed by the FD fruit. If you add it to soup, the broth is being absorbed. If you eat it dry like I do, you'll want to make sure you drink plenty of water so as not to dehydrate or get constipated. Tip: when you purchase berries that you may not be able to use in a day or two, rinse them briefly in a 1:10 solution of vinegar to water, drain well and store in the refrigerator; they should last a good week this way. I've winced a bit when buying freeze dried fruits, but I know that once they are hydrated, I'm not only getting a good value, but a fantastic shelf life as well. When the Waldo Canyon fire hit our area, I went downstairs to the "storeroom" & looked at all of the mason jars filled with food I had neatly stacked on the shelves. It was overwhelming to step back and realize that they would've been left behind. I then looked at our #10 cans, 4oz fruit cans and the 6gal buckets and thought to myself, these are much more manageable to deal with in an emergency. While I con't to can, I also con't to buy #10 cans. and buy freeze dried fruit when they go on sale. Like most people, we live on a tight budget, but we put away a small amount money from each pay check into our "#10 can budget". Even if it's $10.00-$20.00/month, (or more if you can afford to) it adds up. We wait for the sales & buy a few things at a time. What if people had an affordable home freeze dryer? I have a background in them and I believe I can come up with one that would be a real survivor and do the job . Your thoughts on what the requirements might be? Terrific post! This is what I have found to be true as well. PLUS, it's like having a sous chef in a can--all the chopping is already done for me!! Where can I buy these '#10' cans of freeze dried fruits? I don't recall seeing them at my grocery store it in the ads. Staci it does depend on where you live if you will see them in your ads. In Utah there are several stores that carry them. Five Star Preparedness has them available online if you need a source. (by C for Prep Pro) Also here is a link http://www.preparednesspro.com/freeze-dried-preferences for some great references. There actually is a company in [redacted for spam] that makes a (food) freeze dryer. Their website is [redacted for spam]. They are very friendly and helpful at answering any questions about freeze drying your own food. They can freeze dry almost anything - even avocados or ice cream.